Inspired by jazz, opera, rock, and world music, the composer and musician Peter Gordon presented his first symphony, Symphony in 4 Movements, at The Kitchen. 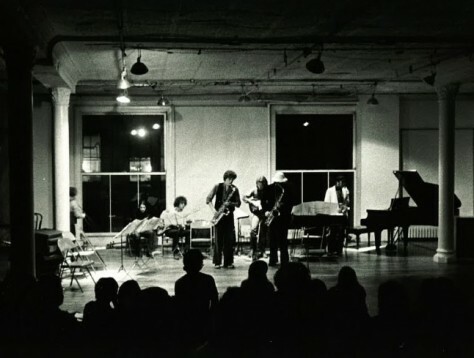 Combining disco, electronic, pop, and jazz elements with experimental music, the four movements of the work were titled Positing the Self, Intervallic Expansion, Machomusic, and A Little Closer to the Stars. This symphony consisted of vocal, saxophone, electric piano, flute, congas, trombone, electric guitar, violin, clarinet, cello, and trumpet that entered and clashed with each other at different intervals. In addition to Gordon, twelve musicians performed including Kathy Acker, Laurie Anderson, Ernie Brooks, Jim Burton, Rhys Chatham, Philip Glass, Scott Johnson, Jill Kroesen, Garrett List, Keshavan Maslak, Charlie Morrow, Arthur Russell, and Bob Bielecki as technical assistant.